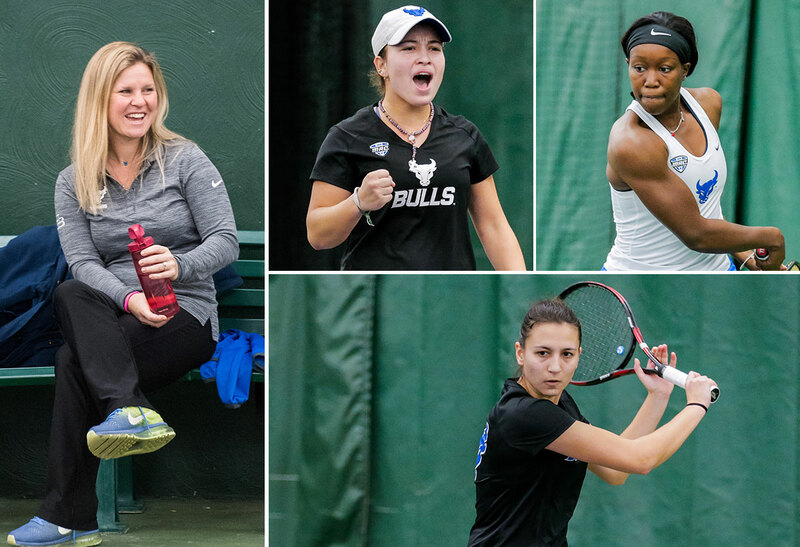 BUFFALO, N.Y. -- After winning their first Mid-American Conference regular season title, the University at Buffalo women's tennis team cleaned up on the postseason awards as head coach Kristen Maines was named the 2018 Mid-American Conference Coach of the Year, while Tanja Stojanovska, Chantal Martinez Blanco, and Lolade Ogungbesan all earned All-MAC honors. Maines becomes the second UB head coach to earn Coach of the Year honors and the first to do so since Kathy Twist won the award in 2006. Maines led the Bulls to their best regular season in school history as UB enters the MAC Tournament with a 15-3 record and a perfect 8-0 mark in MAC play. The Bulls are currently riding a 12-match winning streak and have dominated their competition. As a team, UB is 137-45 in singles action this year and 59-23 in doubles. Stojanovska was named to the All-MAC First Team for the fourth straight season, the first MAC player to earn first team honors for four straight years since Ball State's Courtney Wild (2012-15). Stojanovska is 17-6 on the season in singles action, including 8-3 at second singles. In doubles action she leads the Bulls with a 20-7 record, including a perfect 10-0 at second doubles with teammate Anna Savchenko. After being named to the All-MAC Second Team each of the last two years, Martinez Blanco earned her first All-MAC First Team selection. She is 23-6 this year including 12-4 at first singles and 7-1 during Mid-American Conference play. She is 18-7 in doubles action with Ogungbesan, who was named to the All-MAC Second Team. Ogungbesan is in her first season with the Bulls as a graduate transfer from the University of Pittsburgh. She made quite a mark this year as she leads Buffalo with a 24-6 singles record, playing the majority of the year at third singles where she has a 10-3 record. She was also a perfect 5-0 at second singles. Like Martinez Blanco, Ogungbesan has an 18-7 mark at doubles. Buffalo joined Bowling Green as the two teams to have multiple members on the All-MAC First Team. Their three All-MAC selections are the most in the league. As the top seed, UB will begin MAC Tournament play on Saturday morning in the semifinals against either Bowling Green or Eastern Michigan. As winners of last year's regular season, Ball State is the host of the 2018 MAC Tournament.